During recruitment, a lot of PNMs will ask you for advice for freshman year, or ask you about your sorority experience in general. With so many different experiences comes many different answers to these questions. I realized this is really where the phrase, “you get out of it what you put into it,” comes into play. You’ll hear this a lot throughout your college experience, and even your whole life. Whether it be a club, a sport, a project or a family, it applies to everything. Many people have different sorority experiences, and I’ve found that those that are the most happy and the most in love with their sorority are the ones that are involved in it. 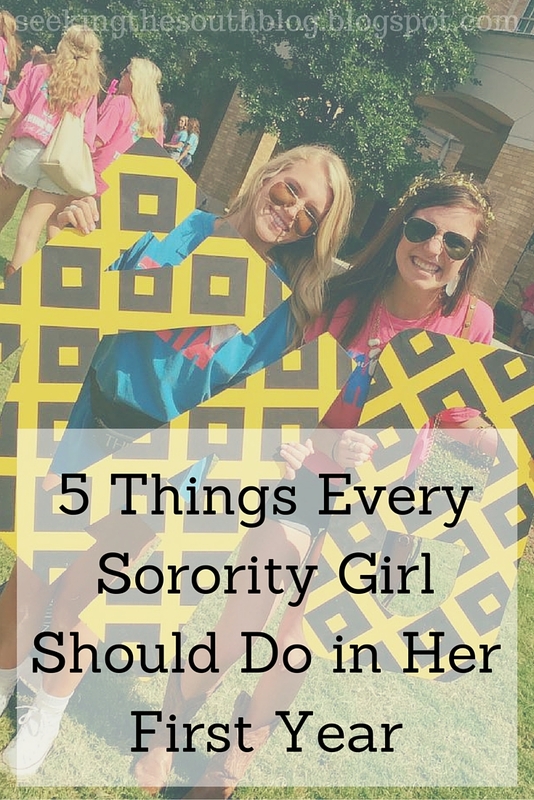 There are tons of different ways to get involved in your sorority, but I’ve narrowed it down to a list of five things every sorority girl should do in her first year. 1. Be open! One of my biggest pet peeves in college is when people are so closed-minded. Like, c’mon people, this is the time of your life to learn about other people. Even worse is when people are so closed-minded they refuse to hang out with people outside of their Greek organization. You’re never going to meet people with different experiences if you only chill with people similar to you. My best friend at school isn’t my sorority, and I’m glad! We’re different majors and even have different interests, but at the end of the day when we sit on the couch and watch HGTV, swapping stories about our lives is the best. 2. Go on Spring Break with your sisters. At a lot of college campuses freshman year Spring Break is a big deal. Everyone rents houses and takes long roadtrips and parties and such. This is how it was for me. At TCU everyone goes to Gulf Shores, Alabama for Spring Break freshman year. It’s known for being a ratchet place and is only good for partying. When my sisters began discussing a group together to go, I was a bit iffy about it. I’m not a huge partier by any means and a week straight of that was not exactly up my alley. But the more I talked to upperclassmen, the more I realized it was more about bonding that it was about partying. The roadtrip alone was 14 hours straight with your sisters. I realized that even if I wasn’t totally comfortable with the party scene, it was a trip I needed to take, and I’m so glad I did. I made friends I never would have gotten close with had I not gone, and was able to make some pretty incredible memories with the group of girls. There were even girls on the trip that partied even less than I did and still had a blast. You don’t have to be a crazy partier to go on freshman year Spring Break. Just go. 3. Branch out. It’s easy to fall into a comfortable routine, especially in college. You make a solid group of friends, you hang out with a solid group of guys and visit a couple restaurants with some really good queso (yes, I’m talking to you Fuzzy’s). When this happens, you plateau. You stop building new relationships and experiences, and you’re limiting yourself. Although having a great friend group is great, it’s always important to continue meeting new people, talking to different people in classes, and even hanging out with other fraternities (*gasp*). 4. Participate in recruitment. I had always heard that you get infinitely closer with your pledge class, and sorority as a whole, during recruitment. I wasn’t really sure how a bunch of screaming, clapping and girl-flirting could do that, but I was willing to try it out. And oh wow, am I glad I did. What they don’t tell you about recruitment is that there’s a lot of fatigue, early mornings, late nights, and mealtimes to bond you with your sorority sisters. Even though at some points all you want is your bed and a solid night’s sleep, you’re all in this together. You’re all dedicated to this one organization that you do give up sleep, a social life and daylight to ensure it get’s the best pledge class of new members. That’s one kind of bond not just anyone shares. 5. Enjoy every. Single. Moment. Eventually you’re going to graduate (don’t remind me). And in the real world, people aren’t really going to care what sorority you were in, what your reputation was on campus, or who was first in grades (*subtle plug for Theta*). Although sororities are great resources for jobs, housing, etc., other than that, all you’ll be is another alum. What you can take from your four (or five, or six) years in a college sorority are the memories. Take it all in. Enjoy the late night jam seshes. Laugh at the party that didn’t end well. Take horrible pictures. At some point, you’re going to wish you enjoyed everything a little bit more, so don’t wait until it’s too late. For those of you who just recently pledged a sorority, congratulations! Get ready for the best four years of your life. I’m so excited for another year of sorority life and all of the memories and excitement associated with it! (I WANT MY LITTLE). What is your advice for sorority girls, or even college students in general? Comment below with what’s on your mind!